Our road to reading started with books. Lots and lots and lots of books. I collect (hoard) books, I can’t help it. I buy books all the time. Bookshops are like magnets that pull me to a much happier world. And I accept donations from my sister who has less impulse buying control than I do. She passes on to me her older children’s books in boxes. Books that I don't know where to put! And I keep them all! (Manic laughter) And my husband knits his bushy eyebrows together and lets out an unhappy (angry) sigh. And I relent and pass on some of our books to my younger niece. But should he wonder about this love affair? I still have the books that I had as a little girl, perfectly preserved on a shelf in my mother’s house, left there with a warning to never, ever let anybody touch those books! Hey, you see? I get highly excited about books. So, let’s go back to what I really want to talk about today: my daughter’s road to reading… or how she seemingly taught herself to read at age three. Being the book lover (hoarder) that I am, we started reading to Little T and Baby Boy when they were still in my tummy. As soon as I recovered from childbirth, I started reading and singing to them. It was more about them hearing the words than looking at the pictures or the words themselves. For a few crazy months when Little T was two, we taught her the alphabet in a really fun way. Basic phonics soon followed. Then a niggling thought occurred to me, one that made me uncomfortable. I thought, why would we teach a two-year old child how to read when she was still a baby? Her job is to play and to explore the world. So we stopped. Then we read about reading and decided not to stress about it. We learned that children will read when they are ready to read and that the strengthening of pre-reading skills, such as enjoying rhymes, is more important. We did not set a timeline for when our daughter should be able to read. We were prepared to wait until she was ready. We were even willing to wait with the Fins, who start formal schooling at age seven. We just continued doing what we have been doing all along: read. We read before we get up from bed in the morning, we read when we nurse, we read in the bathroom (books about the potty! ), we read before we take a nap in the afternoon, we read before we drift off to sleep at night. We read favorite books several times a day, sometimes in just one sitting, until our throats start to feel itchy. We read. Then She Started To Read! Then Little T started reading by herself. She first read road signs, book titles, headlines. I thought she was just guessing, the magic of sight words. Then one night, she read two full sentences of instructions for one of our toys. She was ever so pleased! From then on, there was no stopping her. She would pick up books and read aloud. She proved every time that she could read and that she could understand what she was reading. I was blown away. After all, I did not teach her the mechanics of reading. I did not even know about the C-V-C (consonant-vowel-consonant, I researched) combinations that some people asked me about. As Little T’s confidence in reading grows, she picks up longer books. She reads original chapters of Winnie-the-Pooh, though of course not in one sitting. She reads classic readers that are actually enjoyable: Else Minarik's Little Bear books, Russel Hoban's Frances books, and Arnold Lobel's Frog and Toad books. When she encounters difficult words, she gets frustrated and I ask Mr. Google for help. One time she kept saying "bar" instead of "br". A Google search led me to teach her the beginning consonant blends. I made a game by picking out a card ("br", "cr", "dr", etc) and taking turns saying words that begin with the chosen sound. Two nights and we were done. "Br-" is now always "br", "cr-" is "cr" and not "car", and so on. I am utterly convinced that being surrounded by wonderful books and being read to on a daily basis have provided our child a smooth road to reading. Reading begets reading. I couldn't have taught her even if I wanted to. I am not expecting that Baby Boy will also start reading by three. Every child is different. But we will continue reading to him lots and lots of books, lots and lots of times. There are three of us now who will take turns. You won't regret it, Mimi! This is really inspiring! Parang gusto ko na rin maging collector (hoarder) ng books. :) I will definitely expose my daughter to books. You learn a LOT by just reading books. I'm so glad you did! Welcome! i really love reading books that's why I make it a point that my children also reading books with me and it became their habits..Because in book, you can go in any places without personally going to that particular place but just by reading. tnx. Haha! Did you see the picture of the books in my closet? I actually told my husband I would buy less clothes so we can have more books hehe. Good job about the yaya! You're so right! Sanne and I are in heaven working on our online bookshop :D Yes, The books in the Boxcar Children series are so difficult to find, and I haven't found one yet actually. :) My son who's 17 months couldn't sit still also when I tried to read to him. I had to exaggerate (sing, move, dance) my reading for him to get interested. He's now always asking me to read to him :) Love! Oh wow! Look at all your books! *drool* I love bookstores too; Booksale is my paradise :) Raine, my first daughter, loves reading too. We read to her since birth too. Now she reads on her own. Her favorite so far is the Boxcar Children series (but it's so hard to find!). My second daughter, Breeze, on the other hand, can't sit still long enough to actually go through a whole book or story, even a very short one. But we still try to read to her. I, too, love books! And I love shopping for books rather than for clothes. So I was so grateful when we got many hand-me-down books from my kids' cousins. I also ask the yaya to read to my one-year-old everyday, so to encourage him to talk already. I hope it works! I was 13 y/o when i started reading (really reading with appreciation), and it was a no choice situation because i was in the hospital (bed ridden) and 1 month rest at home. and i think that's pretty late reading for me. Don't worry, dear. :) It's not just posts like yours, of course! There are LOTS of other posts on other great blogs that make me — albeit quickly and temporarily — think about how differently our kids are learning. :) I have always had a tendency to "compare" (blame it on my growing-up years, I guess), so it's something I should and am struggling to deal with on a daily basis! :) LOL! :) Thanks for the encouragement! God bless! hehe thank you! :D she looks so different now, but still cute of course haha! you are so right! :D reading begets reading! can't get over.. cute ni Little T!!! 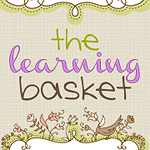 Here at The Learning Basket, you will read about gentle learning ideas for your preschooler as we, as parents, all strive to be our children's first and best teacher. If you want to know more about the what and why of this blog, start here. Or you can go straight to Our Learning Baskets to start making magic at home! Subscribe to get updates on events, giveaways, and special offers! Use coupon code SHIPFREE for free shipping to the Philippines! You will be supporting The Learning Basket, by way of commission, when you click on the We Choose Virtue links and you purchase a product within 60 days. Thank you! Jesse Bear What Will You Wear? Copyright. The Learning Basket. Powered by Blogger.